3 Bdrm Semi-detached Dwellhouse. Ground flr: V/bule. Hall. Lounge. wc. Kitch. Dining rm/Sun lounge. Bdrm with ensuite shower rm. 1st flr: 2 Bdrms. Shower rm (CT band - E). Garden. Garage. Parking. Fixed price £350,000 Entry by arr. Viewing tel Mrs Gray 07487 320584. (EPC band - D). 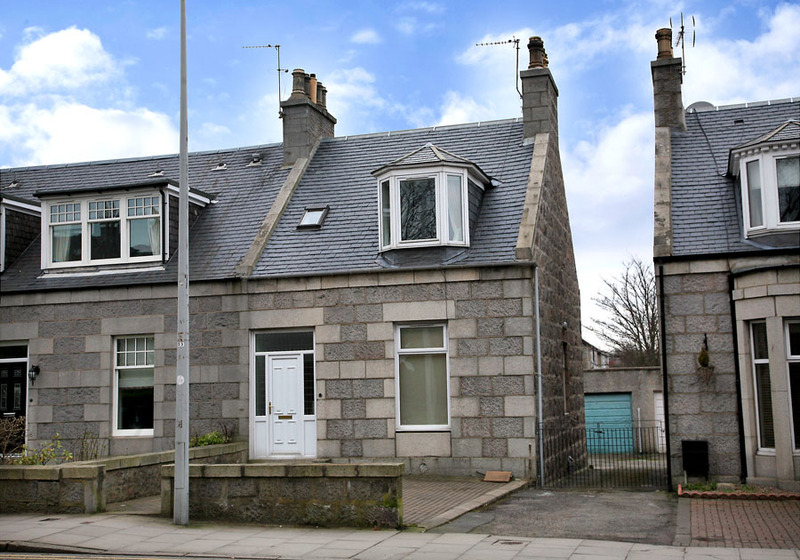 This is a charming semi-detached property on Great Western Road, near its junction with Ashley Park Drive. 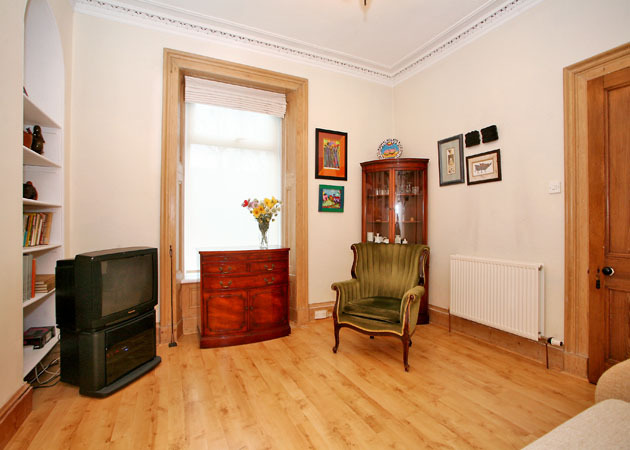 The property is fully double glazed, has gas central heating and has been substantially modernised over the past 10 years or so, while efforts have been made to retain many of the original period features such as ceiling cornices, skirtings, architraves etc. Accommodation comprises, on the ground floor, vestibule, hallway, lounge, bedroom with en-suite shower room, w.c., fitted kitchen and dining room/sun lounge and, upstairs, two further bedrooms and shower room. Further particulars of accommodation are overleaf. Ashley Road Primary School is within a few minutes’ walk. 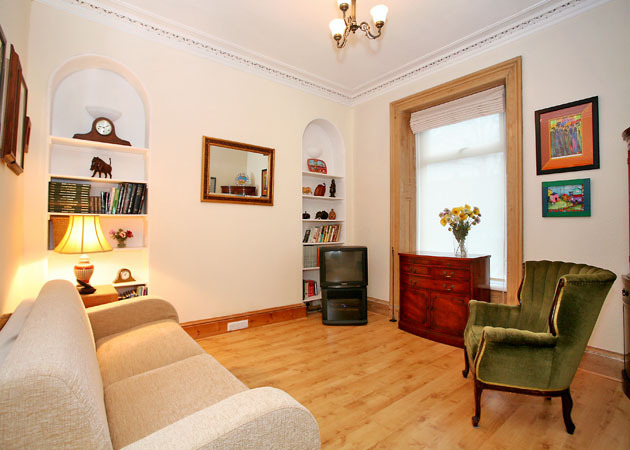 The property is also within easy walking distance of the City Centre, but there are good bus services to and from the City Centre running on Great Western Road. Carpets and floor coverings, curtains and blinds will be included in the sale. All white goods - Fridge Freezer/ Tumble Drier/Washing Machine/Dishwasher will be included in the sale. VESTIBULE: The front door is a modern, well insulated door with double glazed panels to each side and above, meaning that the vestibule is very bright. Ceramic tiled floor. Meter cupboard. 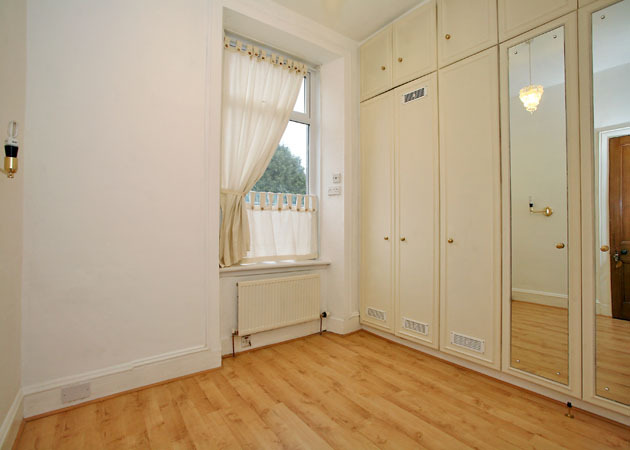 HALLWAY: The hallway has laminate flooring, and skirtings, door architraves etc have all been stripped. 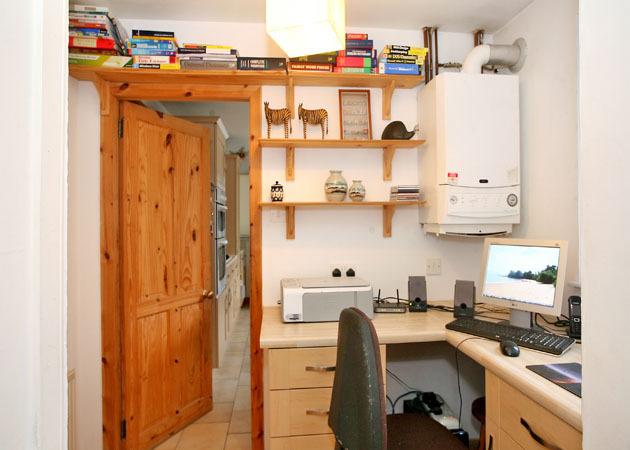 At the far end of the hall, a few steps lead down to a small area (8’ x 5’) in front of the kitchen which has been fitted with a worktop and is ideal for housing computer equipment. 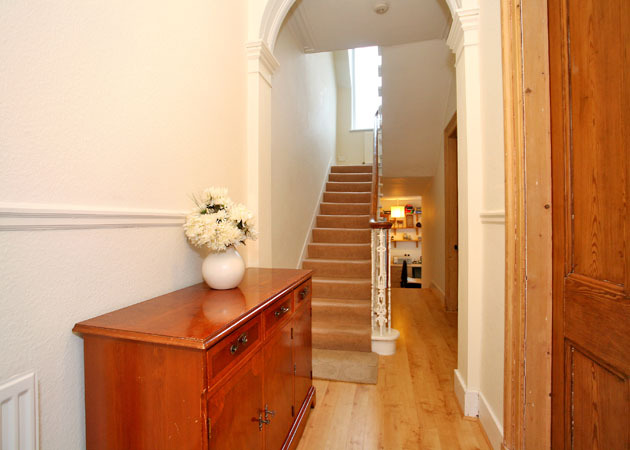 From this same area there is access to large understair cupboard offering a vast amount of storage space. A hatch gives access to the loft space above the kitchen. LOUNGE: (12’6” x 12’3”) As in the hallway, there is a laminate flooring, and the original woodwork has been stripped. An ornate ceiling rose and cornice are particularly attractive features. TV and telephone points. W.C.: Fitted with white pedestal and wash hand basin. Extractor fan. 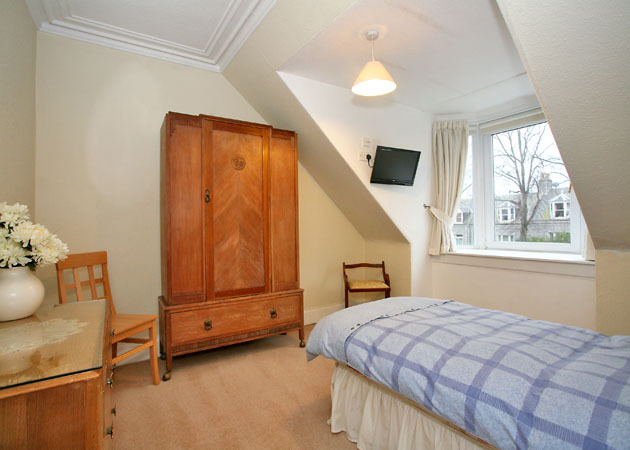 BEDROOM: (9’ x 8’) To the rear of the property, the bedroom has a range of wardrobes fitted along one wall. TV point. 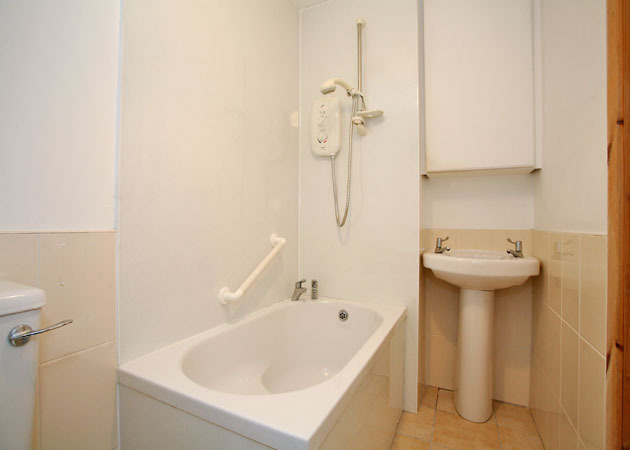 EN-SUITE SHOWER ROOM: With ceramic tiled floor, compact bath with electric shower above. Aqua panels behind bath. There is a large double glazed window, meaning that the room has natural light and ventilation, but there is also an extractor fan. KITCHEN: (15’ x 8’) Fitted with a range of modern floor and wall units. Ample worktop space with tiled splashback. Built-in double oven and gas hob with extractor hood above. 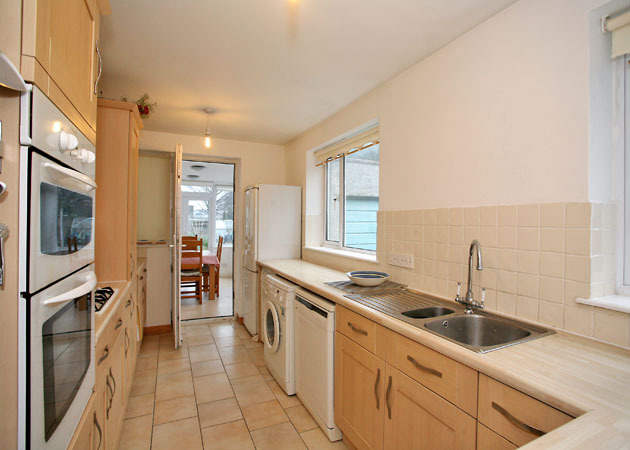 Modern stainless steel 1½ bowl sink unit (note: a waste disposal unit is fitted but is not operational) The kitchen is a very bright room having two double glazed windows to the side of the property. DINING ROOM/SUN ROOM: (13’ x 8’) Beyond the kitchen, this room has windows both to the side and to the rear. 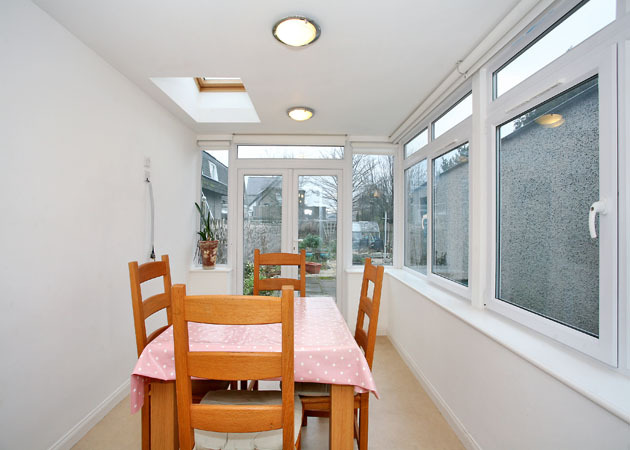 French doors as well as two velux roof lights, meaning that the room is very bright indeed. French doors give access to the rear garden. 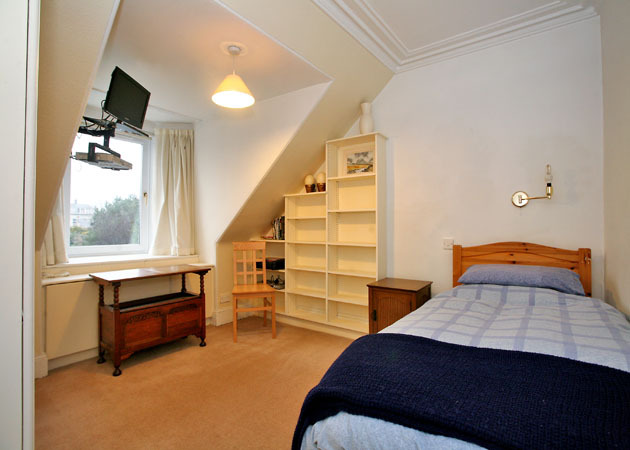 UPSTAIRS:- The stairway is extremely bright, there being a very large double glazed window on the half landing. 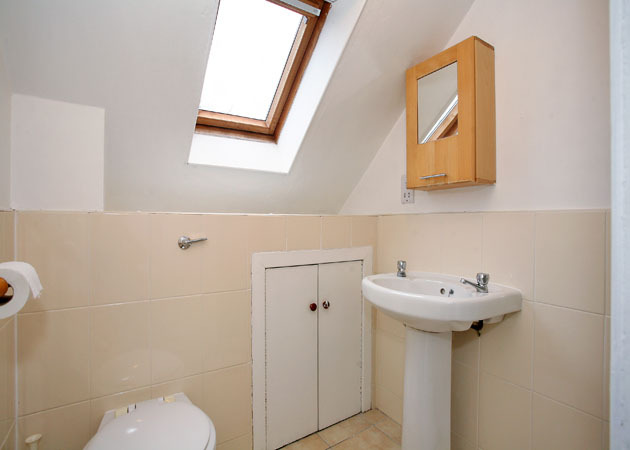 On the upper landing a hatchway gives access to loft space above and there is also a large built-in cupboard. BEDROOM: (11’9” x 11’7”) To the front of the property. TV point and bracket for wall mounting TV. BEDROOM: (11’6” x 9’3”) To the rear of the property. Built-in wardrobes along one wall and shelving on the opposite wall. As with the other upstairs bedroom there is a TV point and bracket for wall mounting TV. 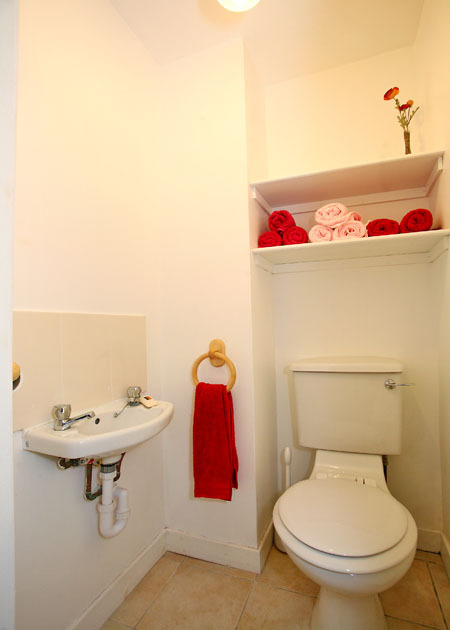 SHOWER ROOM: With heated towel rail. Electric shower in cabinet. The room has natural ventilation (velux roof light) but there is also an extractor fan. 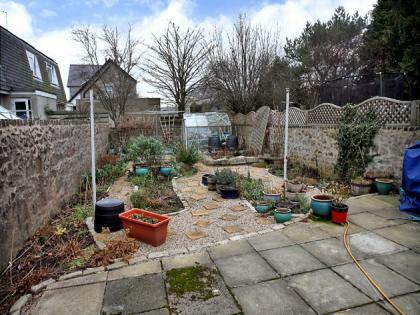 OUTSIDE: The garden is generally low maintenance. To the front of the property the garden has been given over to lock block hard standing. A driveway leads down the side of the property to the garage. In the back garden the area immediately behind the house is paved and the area beyond that laid out in gravel with beds for planting. Greenhouse will remain, as will the rotary clothes drier.